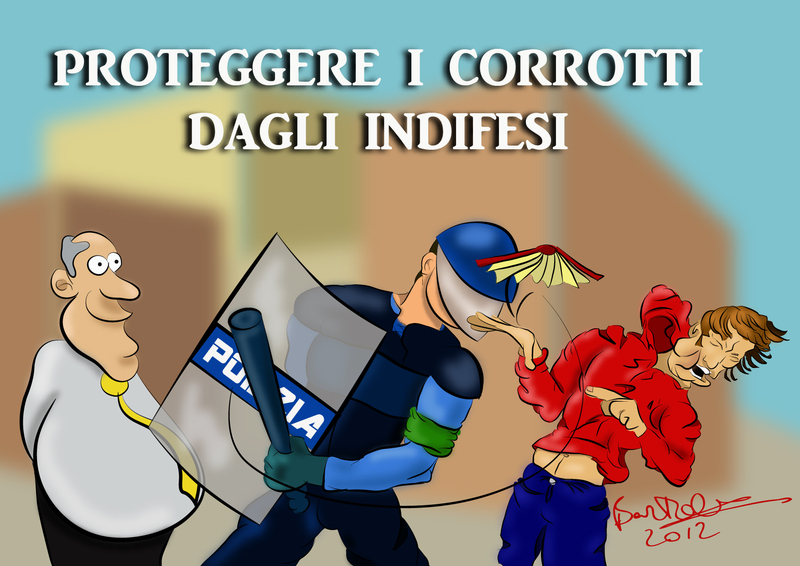 Lately there have been student demonstrations in my Country, Italy, and I have been astonished to know that police have beaten up students protesting over the corruption of our politicians. It is even more astonishing to notice how two days later nobody talks about it anymore on Facebook. I think when you have a strong interest in visual arts and communications it is your duty to do as much as you can to spread the word on topics that are important to you, and this is why I did this drawing. The writing says To protect the Corrupts from the Helpless. I did this drawing in Adobe Illustrator. For the shadowing I used the blob brush, adding a blur effect to simulate the visual effect you have in Photoshop, but with the advantage to keep working on vectors.